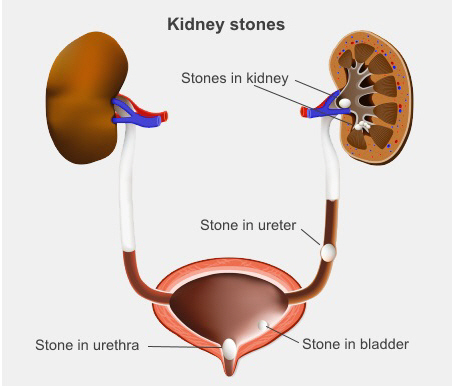 If you have been diagnosed with a stone in your kidney or ureter (the tube draining urine from the kidney), your treatment will depend on the size of your stone. If the stone is small, it will most likely pass out by itself. However, if it is large you may need surgery or another treatment to remove it. Generally, it is better if the stone passes on its own as this avoids the need for any surgery. medicine to help the muscles of your ureter relax so the stone can pass through. surgery to remove very large stones. If the stone is larger, your doctor will refer you to the Urology Department at Christchurch Hospital. Based on the size of your stone, the Urology service will organise your follow-up. If you get any severe pain that is not responding to the pain relief tablets or you have vomiting or a fever, return to your doctor, an after-hours doctor, or the Emergency Department.